In a multitude of people’s eyes, being an artist on Mute Records IS still a big deal. The label formed by Daniel Miller indelibly helped shape the future of electronic music, introducing many to acts from different polar opposites of that genre, from the dark experimental sounds of FAD GADGET and THROBBING GRISTLE to the chart-reaching heights of DEPECHE MODE, YAZOO, ERASURE, MOBY and GOLDFRAPP. Currently carrying the flag and representing both the commercial and more esoteric side of Mute’s synthetic roster is MAPS, aka James Chapman. MAPS first gained attention by being nominated for the Mercury Music prize for the debut 2007 album ‘We Can Create’, a symbiotic mixture of electronica, shoegazing guitars/vocals and heavily reverbed textures which recalled everybody from MY BLOODY VALENTINE to THE BEACH BOYS. The follow-up ‘Turning The Mind’ showcased a more electronic direction and in places a more danceable edge, yet still with Chapman’s distinctive atmospheric/ambient vocals on top. Earlier in the year saw the release of the third MAPS long-player ‘Vicissitude’ which (if anything) has followed an even more electronic template. The current MAPS album features a selection of what appear to be highly personal songs, all of which are produced with rich, electronic textures and a strong melodic backbone. Standout tracks include the oblique ‘A.M.A.’, the uplifting/inspiring ‘You Will Find A Way’ and ‘Built To Last’, a song which will appeal to anybody who’s suffered a relationship-inflicted kick in the teeth! The album is not afraid to let its instrumental synthesizer sections shine and the Spotify version features a couple of self-remixed versions of both ‘A.M.A.’ and ‘I Heard Them Say’ which take the original versions on extended electronic journeys which are arguably even stronger than their aforementioned counterparts. The Electricity Club’s Paul Boddy caught up with the man behind MAPS, James Chapman and quizzed him on what had help shape his sound, his relationship with Mute Records and how it felt to remix DEPECHE MODE. ‘Vicissitude’ had a fairly long gestation period, what was your overall concept and reasoning for making the album? The concept kind of developed as I started writing the songs, there were recurring themes to the lyrics and feel of the music which then became the overall theme of the album. I went through a tough time personally before I started this album, so I think that came through in the songs I was writing. Although you use primarily electronics in your music, there’s been a gradual shift in the sounds that you use. ‘Vicissitude’ has a far more analogue sound than ‘We Can Create’, which is more organic, (literally as it does have a lot of organ sounds on it!) Is there a particular reason for that? That’s funny that you picked up on the organ sounds on ‘We Can Create’! That is true. Mainly due to the fact that I really only used one sequencer back then, so a lot of the sounds I used tended to be the same ones. To answer your question, I feel it has a lot to do with the equipment you are using which gives a record the overall sound. For ‘Vicissitude’, I wanted to create a more open spacious sounding album (‘Turning The Mind’ was quite claustrophobic). So once you decide what you want to achieve, it’s really just about using the correct equipment to try and realise that vision. A lot of your music sounds as if it’s very cathartic? How do you come up with your lyrical themes? Yes it is a cathartic process for me. When writing, I normally start with the music, and snatches of lyrics will come into my head when working on that. I’m quite obsessive when working on the music, so after hearing a song for about 50 times, the lyrics are pretty much written in my head! For this album I had a lot to draw on from some personal experiences, but I tried to keep the lyrics more open to interpretation so more people could relate to them. One of the standout tracks on ‘Vicissitude’ is ‘A.M.A.’, especially the version for Spotify where you remixed yourself, the extended ending is wonderful… do you have a preference between the two versions? Thanks, I’m glad you like it. I like both versions actually. A few people have asked me whether it’s hard to remix your own material, but I actually just approached those remixes the same way. It was fun to try something different with my own song – I enjoy doing remixes because it feels like there is more freedom to experiment and play around a bit more. Your first album ‘We Can Create’ had the honour of a Mercury Music Prize nomination, was that a blessing or a curse? It was a blessing because it meant that my music reached far more people than I could have ever imagined possible. I wouldn’t say it was a curse at all. I guess it was hard not to feel some pressure with what I followed up with, but I really just try to make the music I enjoy making and hope that people connect with it. I think if you start to measure the success of the music by what other people think of it, then you’re in trouble. What sort of a relationship do you have with Mute records in terms of their influence on the music that you produce? It’s been different with each album, but they’ve always been great with letting me do what I want to do. With this album they really just told me to go away and make the album I wanted to make, which I thought was a wonderful thing for any record label to say. Mute will always be associated with electronic acts that achieved commercial success such as YAZOO, GOLDFRAPP, ERASURE and DEPECHE MODE but it’s also always been a home to electronic artists who have tended to be more leftfield and experimental – which camp would you put your sound into? I’d like to think that my music could be split into both those camps but I really don’t know. I do like to experiment with the sounds I make and that’s always when I’m happiest in the studio. But I also realise that it’s important to make music that has a melodic quality to it, so I do keep that in mind when writing the songs. This album was much more about the songwriting aspect, but I still wanted to push MAPS forward sonically as well. Who would you say were your main musical influences? It’s always changing. And it’s been different for each album. For ‘We Can Create’, I was listening to a lot of American guitar bands and IDM electronica and for ‘Turning The Mind’, I was listening to harder minimal techno type stuff. For this album, I got heavily into more experimental electronica and weird movie soundtracks! But overall there’s always THE BEACH BOYS, THE BYRDS and BOB DYLAN who I return to. Like the early days of Mute, even now there’s a proliferation of synth duos around, yet very few artists that are completely self-contained – does being a one man band have both its benefits and limitations? It has a great deal of benefits, mainly because of the freedom in creativity. You can go a bit crazy sometimes when you’ve listened to the same track for days and you start to lose objectivity. But I’m used to the process now so I wouldn’t change it for the world. The limitations come when performing live – it’s always been tricky to figure out a way to get it to work because I never wanted to play live just on my own. It’s nice to have the camaraderie of other people when playing live. Haha! That’s interesting. Well I should say that I never learnt the rules of recording properly, I taught myself all that stuff as I went a long. I think my production has definitely improved over the years and I have certain tricks that I’ve picked up along the way. I think it’s true that too many different reverbs can make things messy. It’s good to just use one global reverb as a starting point to gel the mix together, otherwise it starts to get complicated! What sort of equipment do you use in the studio and how do you go about your songwriting? From the very beginning my favourite bit of equipment was the Yamaha RM1x – I used to compose whole albums on that! Over the years I’ve been lucky enough to collect other bits of equipment. 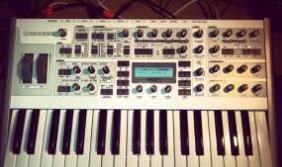 My current favourite is the Access Virus TI Polar. It is insane! I do really believe that it’s more about choosing one bit of equipment you enjoy using and getting to know it inside out. Having too much choice can be a negative thing. The limitations lead to being creative I think. So with the songwriting, I like to keep it simple and stick to mainly writing on the same synth. How did it feel to be asked to remix DEPECHE MODE’s ‘Should Be Higher’ and did you approach this one any differently to other remixes you’ve done? It was a really honour to be asked. I did spend a lot of time on it, but I do with all my remixes. I don’t think I approached it that differently, but I wanted to stay respectful to the song, so I didn’t mess around with the structure too much. I’m happy that they liked what I did. What do you see as the future of MAPS? I’m going to take a bit of time to experiment and try some new projects. I’m not sure exactly what the future holds for MAPS just yet, but I’m going to branch out and explore some different territory. I’m excited to see what happens!